Hello! Bonjour! Hola! 你好 Hujambo! Hello in every language to CiteAb visitors from around the world! Well, from 102 countries to be exact. 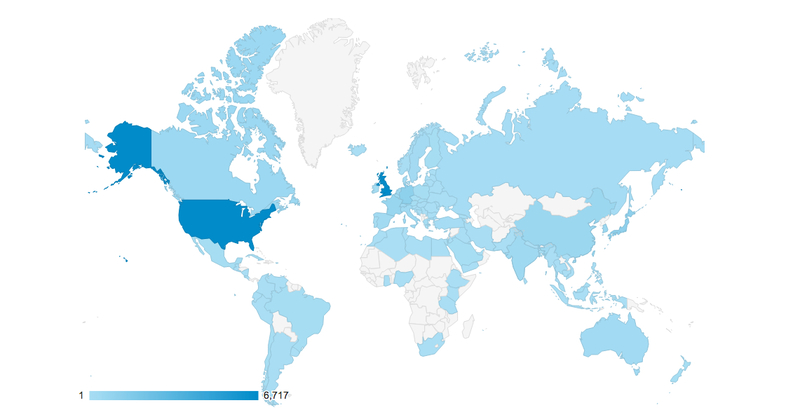 Since we launched in March we’ve had visitors to CiteAb from every continent. The country with the most visitors to date is the United States of America, which overtook Britain in the spring following a launch that our team here at CiteAb ran to make American research centres aware of the site. Every country in Europe is represented on our list of visitors, from Britain, France and Germany near the very top, through to Latvia and Luxembourg further down. Even researchers from tiny landlocked Liechtenstein, bordered by Austria and Switzerland, have found and are using CiteAb! Researchers from the east are clearly finding CiteAb useful too – China, Taiwan, Japan Singapore, Vietnam, Malaysia, the Philippines and South Korea have high visit levels. With less visits but still represented are Cambodia and Myanmar (previously Burma). Africa is also well represented in our list – we’ve had visits from Algeria, Ethiopia, Ghana, Libya, Nigeria, Tanzania and South Africa to name just a few. In South America we’ve helped researchers from Brazil, Argentina, Chile, Colombia, Peru and Ecuador, all the way up to Cuba, Mexico and the Dominican Republic. There is also good representation from the Middle East, where there has been a great deal of development in science research over recent years. And we mustn’t forget some of our top visitors – Canada, Australia and India. We’re thrilled that we’re having an impact all around the world, and that our visitors are finding CiteAb useful, returning to the site time and again. Looking at our map, we just wish we could come and visit you all! Meeting our 2019 award winners!